DCS President and CEO Jacob Weed recently joined other local businesses at Red Jacket Elementary School for their career fair with his son, Lorenzo. Students attending the career fair were able to explore booths set up by various businesses and learn about careers they might want to pursue. 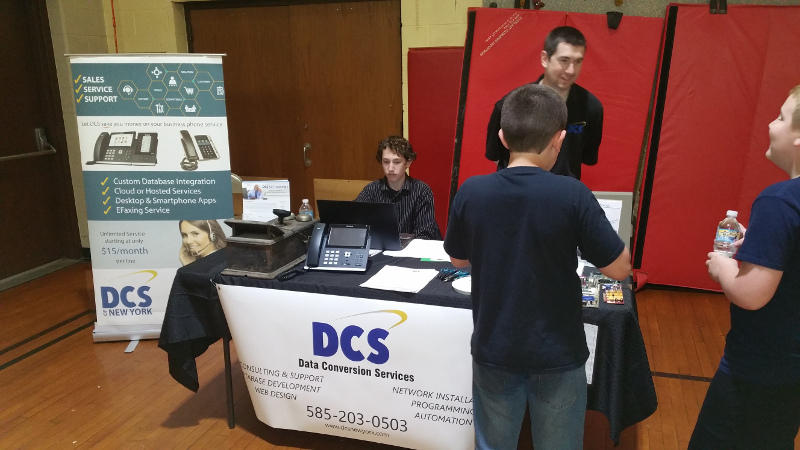 DCS was there to talk about networking and computer technologies. Some of the highlights they focused on were how technologies have changed over time, illustrated by displaying an antique switchboard telephone beside a modern business phone with a touchscreen interface. Jacob also used his own cell phone to illustrate the size of a modern computer compared with an older PC circuit board. Kids were also given educational puzzles to do in their spare time. What a great way to teach kids about the amazing occupational opportunities awaiting them. Thanks, Red Jacket, for the opportunity to participate! Pictured: Jacob talks to Red Jacket Elementary students at the DCS booth.